It was announced Tuesday 15 March 2011 that The Darkness, the multi-award winning band from East Anglia, with hits including ‘I Believe In A Thing Called Love’, ‘Growing On Me’, ‘Christmas Time (Don’t Let The Bells End)’ and ‘One Way Ticket’ have reunited after a five year gap. They will be performing at Download Festival on Friday 10 June alongside six other acts that have now been announced. 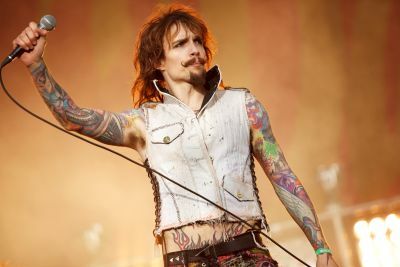 This performance with the original line up of Justin Hawkins, Dan Hawkins, Ed Graham and Frankie Poullain will mark the band’s first festival appearance since splitting in 2006. The Darkness will appear as special guests to headliners Def Leppard on the opening night of the Download Festival. The Darkness’ first album Permission to Land was released in 2003, hitting the No. 1 spot in the UK Album Charts and winning ‘MasterCard British Album’ at the 2004 BRIT Awards (along with ‘Best British Group’ and ‘British Rock Act’). Permission to Land went five times Platinum and sold over 1.5 million copies, remaining in the UK charts for 76 weeks. Their second album, ‘One Way Ticket To Hell…and Back’ was released in 2005 and hit No. 11 in the charts, with both singles from the album ‘One Way Ticket’ and ‘Is It Just Me’ going Top Ten. Between 2003 and 2006, alongside three BRIT Awards, the band won an Ivor Novello in 2004 for ‘Songwriters Of The Year’, four Kerrang! Awards, two Metal Hammer Awards, an MTV Europe Music Award and even an Elle Style Award, in 2004 for ‘Most Stylish Band’. Download Festival organisers have announced an additional six acts for this year’s event. Continuing the Brit-rock theme, Funeral For A Friend and Skunk Anansie have been confirmed. Funeral For A Friend are currently riding high on their fifth studio album ‘Welcome Home Armageddon’, and Skunk Anansie are currently booking European dates in support of their most recent album ‘Wonderlustre’. Chicago pop-rockers Plain White T’s, Norway metal heads Kvelertak, Nashville rockers Framing Hanley and American hip hop artist Hyro Da Hero, who has collaborated with Welsh rockers The Blackout on their single ‘Higher and Higher’, have also been announced.